URGENTVIETNAMVISA.COM (UVV) - RUSH & URGENT VIETNAM ON ARRIVAL SPECIALIST. Rush Visa is necessary for those who change their travel plans at the last minute, arrive at the airport without an approval letter or other uncontrolled reasons. UrgentVietnamVisa.com is the one and only visa agency that specializing in emergency case even on Saturday, Sunday or Public Holidays! (TRAVPR.COM) VIET NAM - August 27th, 2018 - VIETNAM - June 8th, 2016 - Rush & Urgent Vietnam visa on arrival service is beneficial for those who forget to apply for Vietnam visa in advance or who have sudden business in Vietnam. In the continuing effort to provide this special service, UrgentVietnamVisa.com assures that you will never miss your flight to Vietnam if you contact them early enough. In emergency cases, it takes only 15 minutes to complete a visa approval letter to send to customer via email. You should consider before applying for rush Vietnam visa since you might be subject to higher processing fee than normal ones. 1, Next Day (08 working hours process): The letter will be sent by 17:30 if you submit your application and pay the processing fee before 08:00AM on same day. Otherwise, letter will be send by 17:30 on next day. 2, Same Day (04 working hours process): The letter will be sent by 12:15PM if you submit your application and pay the processing fee before 08:00AM on same day. If application is submitted between 8:00AM and 10:00AM then the letter will be sent by 17:30 on same day. Otherwise, letter will be send by 12:15 on next day. 6, Weekend & Holidays (01 hour process): This option is available on Weekends & public holidays only. It takes around 01 hour to process your application and send the approval letter to your email once you submit your application and make a payment for processing fee successful. Fast track service is always recommended in this case. Fri: From 12:00 Pm -> Saturday and Sunday. Public holidays will be announced on our website and automatically added to booking system. Moreover, UVV offers a big discount for group of travelers from 02 persons up to 15% off. Another 5% will be added for returned customer who book the service from 2nd time. 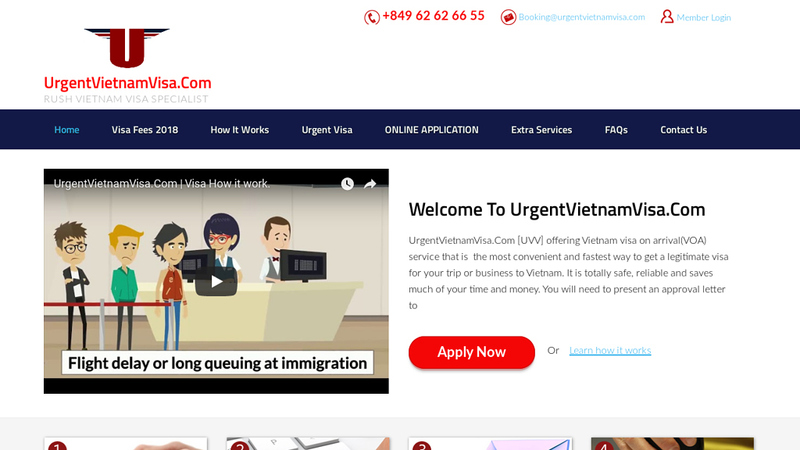 UrgentVietnamVisa.com (UVV) is a private/commercial website offering advices, informations, and visa approval letter for individuals, families, and businesses in need of visa to Vietnam. Airport transfers (https://www.urgentvietnamvisa.com/transfers/) and Visa Extensions (https://www.urgentvietnamvisa.com/visa-extension).